Successful vegetated roofs can only come about through collaboration and understanding. Maintenance-free vegetated roofs do not exist. The intensity and the frequency of maintenance varies with the plantings chosen, the density and coverage of those plants, and the maturity. After making certain in the design and implementation of the vegetated roof that accessibility has been ensured and potential problems headed off, maintenance is essential to perform on a regular basis. Weeds are merely undesirable plants in locations where they are not wanted. On extensive and semi-intensive vegetated roofs, they may include willows, poplars, annual grasses, and forbs, as well as certain perennial plants. They can be undesirable for a variety of reasons—the most common being potentially damaging to the integrity of the roofing membrane or the original plantings. Trees fall in the former category and plants such as crabgrass, because of the allelopathy (i.e. chemicals exuded that prevent other plants from growing in their root zones), in the latter. The simplest way of dealing with weeds is to remove them when they are small, preferably before going to seed. If a seed bank is allowed to establish, weeding visits will become more frequent and more intense. It is therefore very important not to neglect weeding. The best way to keep weeds at bay is by making it physically difficult for them to establish. That can be done easily by maintaining as close to 100 per cent vegetation coverage as possible. This ensures seeds from other plants have a hard time finding bare spots to germinate and establish. Nutrients and water are the key to a healthy dense green roof. It is recommended to perform a soil test for nutrient availability on a regular frequency, once every 12 to 24 months. The test results allow assessment of the nutritional needs of the green roof and the application of a nutrient source when needed. Both chemical and organic fertilizers can be used for this purpose, based on the readings in the soil test. The nutrient concentration (N-P-K plus minors) in the fertilizer dictates the application rate. If all nutrients are intended to be applied in one application, a controlled-release fertilizer is recommended. These provide measured nutrient release throughout the growing season, based on the growing conditions encountered; they prevent nutrient runoff from occurring. Fertilisers that do not have a controlled-release feature may need to be applied in multiple applications throughout the growing season to prevent runoff. Granular products are generally easiest to work with. Bulky products with low nutrient concentrations and liquid fertilizers are often impractical to apply on green roofs. Proper feeding not only makes the green roof perform its intended functions better, but it also improves tolerance of adverse weather conditions such as drought. The need to water vegetated roofs must be based on prevailing weather conditions in combination with plant selection. The need will be based on a judgement call by an experienced horticulturist. 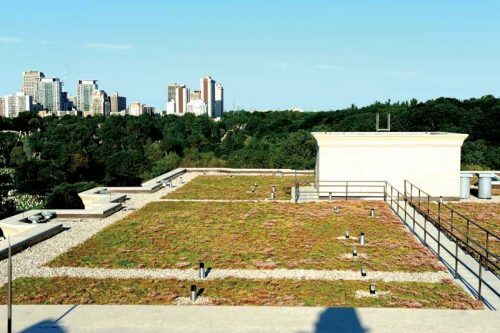 Most green roof manufacturers will provide guidelines on what to look for to determine water needs. Weather conditions such as the drought in the B.C. Lower Mainland last summer or the drought of 2012 in Southern Ontario will cause significant damage to green roof plantings if watering does not occur in a timely fashion and quantity. Every green roof should have a general cleanup done at least once or twice per year. Aside from removing general human detritus, this should include such specific tasks as removing plants from drain boxes from the vegetation-free zones. Plantings that are grass- and perennial-based need to be cut back and the foliage removed regularly to ensure the dried foliage does not present a potential fire hazard. Record-keeping is the key to solving problems when they occur. Even a succinct checklist log of the activities during maintenance can make tracing and solving problems considerably easier when they occur. For more on this topic, check out the authors’ article in the July 2016 issue of Construction Canada, which explores the design of extensive and semi-extensive vegetated roofs for long-term performance. Kees Govers, B.Sc. (Agr), GRP, is the technical sales manager for LiveRoof Ontario Inc. He has had a long career in production management of large-scale commercial horticultural operations for woody plants and perennials before joining the LiveRoof green roof network in 2006. Govers has served on the London Chapter, the Growers Commodity Group, and the Provincial Board of Directors of Landscape Ontario; he is currently the director for the London Chapter of CSC. Govers can be reached at kees@liveroofontario.ca. Sasha Aguilera, B.Arch, GRP, is a client services and design consultant for Xeroflor Canada. A green roof consultant for nearly 10 years, she has considerable experience working with designers and contractors on vegetated roofs of various complexities, from retrofits to new construction. Based in Toronto, Aguilera regularly travels coast to coast, certifying installers and inspecting installations. She can be reached via e-mail at sasha@xeroflorcanada.ca.